I am a super visual person, so the easiest way for me to process information and better understand things is to see it in some kind of illustration. 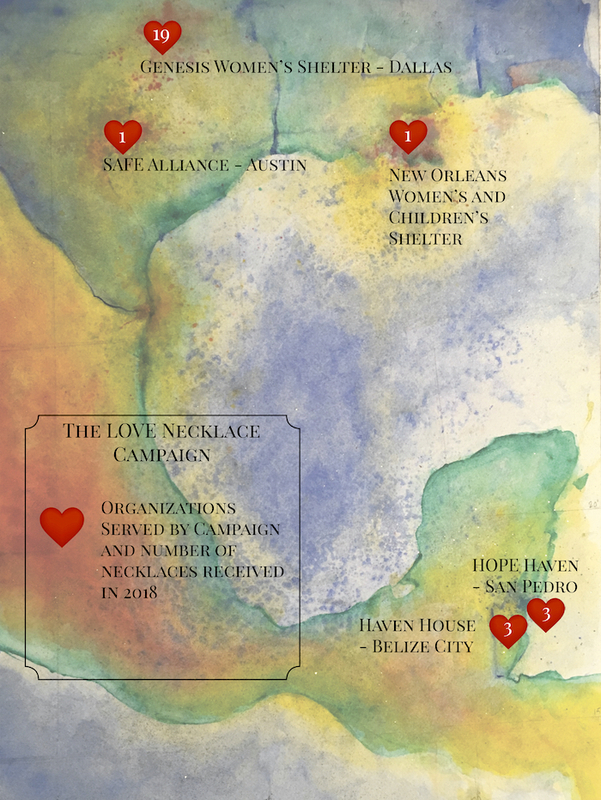 I created this map as a tool to gain an idea of the current impact that the LOVE Necklace Campaign is making so I can devise a plan to make it stronger. I chose to serve women's shelters in Dallas, Austin, Belize, and New Orleans because these are the settings of my novel, Sketches from the Heart of a Texas Artist and each represent a place of self-discovery along the main character's journey toward healing. I have no intention of limiting the places, or the number of women who are served through this Campaign, but I had to start somewhere. On that note, with Mother's Day coming up this week, I believe it will be impactful to be able to present each of these shelters with LOVE Necklace donations, through the One-for-One Giving Campaign. For those who purchase the necklace, it's seriously a win-win. Not only will you be able to give a LOVE Necklace to your mother (or any mother you know) as a reminder of how much you love her, but a mother receiving care at one of these shelters will receive one as well. When you click here to purchase a necklace, you will get a drop down menu that will allow you to chose which shelter you would like to receive the necklace. The map below indicates how many necklaces each shelter has currently received this year.